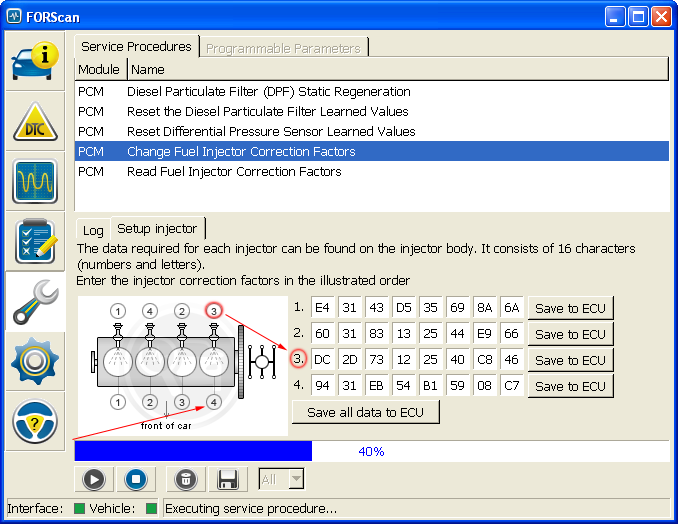 In this article we discuss the following service task: configuration of fuel injectors installed on the Duratorq HPCR engines (Ford Focus Mk1 1.8 TDCi, Mondeo Mk3 2.0/2.2 TDCi, Ford Transit 2.0/2.4 TDCi before 2006, Transit Connect 1.8 TDCi ), equipped with Delphi components. The operation is necessary in case of injectors repair or replacement. The issue is that every injector of this type has so-called C2I - an individual code that reflects the injector's parameters. This code must be saved to ECU in order to keep an optimal system operation. The specific of this type of control unit is that it is very important to save the right code. More than, as illustrated in the example below, in some cases the system works in a malfunction mode ("safe" mode with limitations) unless the C2I code is saved after the repair or replacement. 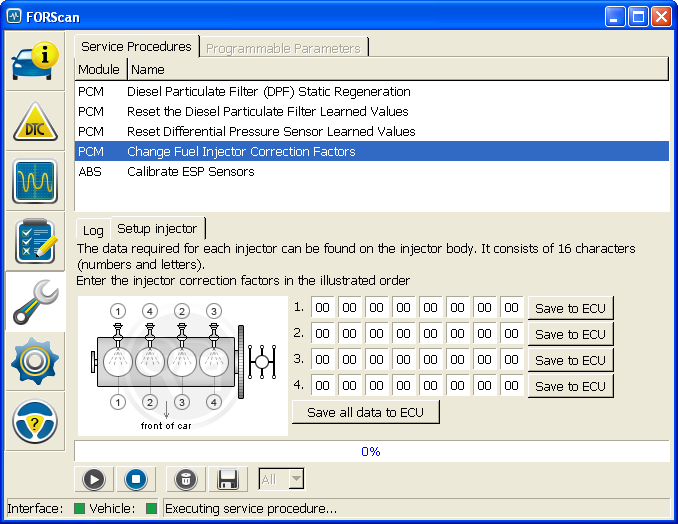 The article is based on a real example resolving the injector problem using FORScan (version 2.1.17). We were approached by an owner of Ford Mondeo Mk3 2.0 TDCi 2005 (115 hp). He had the following problem: the engine has troubles with cold start (requires at least 5 attempts or more), runs unstable and produces a lot of dove-colored smoke after the start. Running the engine is stabilized after warming up to 60-80 degrees of Celsius, but the vehicle acceleration is very poor. Check Engine light is on and the glow plug indicator is blinking, it means serious malfunction registered by the control unit and most likely limited mode of work. Previous owner has repaired one of injectors, but was unable to find an appropriate scanner to reset the error, this is why the MIL is on. New owner has tried to address this issue to two different Ford engine specialists, and they both said the engine has lost a compression and has to be replaced (as realized later - without measuring the compression). Together with other codes we see here DTC P2339 - knock control limit reached for the cylinder #4. Other codes either not directly related to the problem or caused by unsuccessful attempts to run the engine and dead battery. But P2339 is exactly the code that caused the Check Engine light and blinking glow plug indicator. It looks like it appeared with the injector malfunction and remained after the injector was repaired. This error can not be simply reset as other DTC codes - we have to (re)configure the injector in order to restore normal system operations. As a side note: a normal repair of Delphi injector requires a special stand (Hartridge). The stand does calc a new C2I code after the repair. But such stands are not widespread at all. If the injector was repaired in a home-made way, it is not possible to obtain new C2I code. In this case we have no other choice than re-write the same old injector code to the ECU memory. First, this code is the closest one. Second, this is the only way to let ECU know that we have set new injector up so it can switch from emergency to normal mode of work and reset the error. The DTC P2339 tells us about malfunction in the cylinder #4 (DTCs P2336, P2337 and P2338 are responsible for other cylinders). Now we need to determine what injector has to be addressed. The problem is that on Duratorq engines injectors and cylinders are numbered in different orders. Cylinders are numbered from the belt to the gearbox (symbolically represented on the picture), but injectors are numbered in firing order. Cylinders' order is represented below the picture, injectors' numbering is above the picture. So we have to find number of cylinder at the bottom and find the injector that matches to it using numbers above the picture. In this case Cylinder #4 has injector #3 and 3rd line of records. Now we have to write the C2I code. In case of we save a new code, everything is clear - we just enter new code and click "Save to ECU" (or "Save all data to ECU" if we want to save several codes at once). But in this case we already have the code in memory, so how to proceed and make sure the code has been re-written? There are two options here: either check the main criterion (reset of DTC P233x), or perform this operation in two stages. On first stage we save some other code (correct one! ), for example, from a neighbouring injector. And on the second stage re-enter the old code (of course, you have to preliminary save it somewhere preliminary or make a screenshot). After every save operation FORScan finalizes the service procedure, so it has to be run 2 times. After performing this operation on this Mondeo the glow plug indicator and Check Engine light disappeared, all troubles with cold start gone, and the new owner was pleasantly surprized with perfect vehicle acceleration. So FORScan displays zeroes instead of injector codes. Some users think that it means FORScan cannot program this ECU. This is not correct. 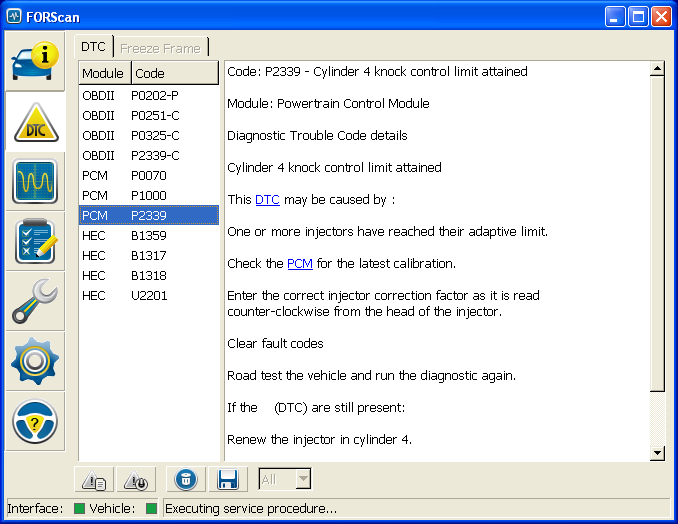 These ECUs have two different methods to save and read the C2I codes. Relatively speaking, the ECUs have 2 cells, A and B, where A is used to save C2I codes and B is used to read them. So, pre-2003 vehicles have no the cell B. But the cell A is present and can be addressed in the same wayas on later models. In other words, injector codes can be saved in the same way as described above, just with no ability to control saved codes visually. So result of operation has to be tracked by the main criterion - reset of errors and restoring normal work of engine. By the way, this is why we do not recommend to use the popular F-Super and his application Formidable to save injector data. The problem is that this application does not save the C2I codes to the cell A, instead of it saves it right to the cell B. We don't know how this works as the connection between cells A and B is hidden inside of ECU. In any case we consider this implementation is not very correct and confusing. Besides, it doesn't work on pre-2003 models. Finally, we would like to note that this service function for pre-CAN TDCi works reliably only since FORScan v2.1.17. In the past we started to receive complaints like: your article is wrong, your procedure is wrong as it uses incorrect cylinder order. You show 1-4-2-3 but it must be 1-3-4-2 etc. and try to imagine you are PCM and firing the injectors in the injectors' order (upper line of number on the picture), and look what cylinders will work. So as you may see, you get the right firing order known from ETIS, workshop manuals and other reliable sources. : 1-3-4-2. The idea of 2 orders was exactly to avoid the confusion in case of programming different types of engines.